Botswana's new Minister of Investment, Trade and Industry, Bogolo Kenewendo. (file photo). Social media users across the continent are celebrating the appointment of 30 year-old Bogolo Joy Kenewendo as Botswana's new Investment, Trade and Industry Minister. Kenewendo first joined parliament in 2016 as an MP becoming the country's youngest MP. Kenewendo is a trained trade and economic diplomacy professional. However, her accession to parliament and cabinet at such a young age is not the only reason why she should be everyone's career goals. 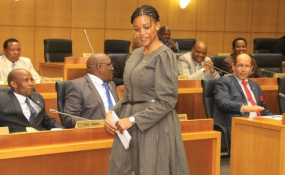 Social media users across the continent are celebrating the appointment of 30 year-old Bogolo Joy Kenewendo as Botswana's new Investment, Trade and Industry Minister. The country's new president Mokgweetsi Masisi announced his 18-member cabinet which includes the country's youngest Member of Parliament (MP) Kenewendo. Kenewendo first joined parliament in 2016 as an MP specially elected by former president Ian Khama. Kenewendo, is more highly qualified than many of her older counterparts on the continent. In addition, her accession is on merit - something that also sets her apart. Her reaction to the nomination as an MP? "I was a ball of emotions upon receiving President Khama's phone call," she told The Voice newspaper. "It is a call one doesn't expect but when it comes, you feel grateful and honoured that you are not only doing well but being noticed. I now get to serve my country and look forward to being a voice for many more young people out there." "I kept my lips sealed about my appointment until I told my parents when the time was right. In the last week I took the oath of allegiance and gave my maiden contribution in parliament. My phone has never been busier. I am really humbled by all the well wishes." Concerning her chosen career path, Kenewendo says she is clear on her mandate but also keeps an open mind on which direction to take. "My path has kept changing as my life changes and as I see new opportunities, but the consistent undertone is my desire to impact development through policy in one office or the other. I am passionate about youth and women empowerment. There is so much more we can accomplish by ensuring that we invest in these resources. There is also a need for economic development, especially through private sector growth," said the young MP. Kenewendo is from Motopi village in the Boteti area of Botswana. From the start of her career she has been an active advocate and adviser on socio-economic issues and private sector development. She has a BA in Economics from the University of Botswana and is a certified Project Manager. She went on to receive a Chevening scholarship at the University of Sussex in the United Kingdom, where she got an MSc in International Economics. While completing her BA, she had the unique experience of taking part in the exchange programme at Pitzer College and completing the regional integration programme at Tor Vergata University in Rome. Although it might seem like the young dynamo burst onto the political stage from nowhere, her journey has included admirable work through Molaya Kgosi, a women leadership and mentorship programme. Kenewendo was one of the founders of this programme following her encounter with the US First Lady Michelle Obama during her Young African Leaders Initiative (Yali) experience. The programme seeks to address intergenerational issues through mentor and mentee engagement by bringing together seasoned professionals and young learners. Molaya Kgosi has been rolled out in schools and continues to be a valuable educational tool. "Behind every county there are great women and I celebrate women. There are so many people I admire: Dr Gaositwe Chiepe is phenomenal. Everyone has a unique story to tell and they all inspire me. I am hoping - in fact, I know for sure - that through my work I will be meeting many more people to learn from," said Kenewendo. For several years she was based in Ghana, working as a trade economist in the Ministry of Trade and Industry in the Government of Ghana. "I absolutely loved living and working in Ghana. Ghanaians are warm people and I appreciated their hospitality. Working there opened my eyes to industries that we [Botswana] aren't strong in, such as agriculture. I admire Ghana's diversity and potential. I learnt to be strong in a new environment, to be more bullish and assertive in my stance. I also learnt to listen and understand others in order to be understood," she says, looking back. Kenewendo was one of the first Botswana Youth Representatives to the United Nations General Assembly, where she was nominated to present a statement on the topic of "global youth" to the then Secretary-General of the United Nations, Ban Ki Moon. She is also a beneficiary and alumni of the US President's Young African Leaders Initiative for young women. In 2012 she was honoured with the Ten Outstanding Young Persons award by JCI Botswana and in 2016 with the Botswana Change Makers Award in Business and Leadership, as well as the Formidable Woman award. In that same year she was also honoured by the UK Foreign and Commonwealth Office International Leaders Programme. Bogolo Kenewendo has so many achievements under her belt, and it is clear that her country will benefit from many more to come.